There aren’t many mini-ITX ARM board, and the only one I can recall is Kontron KTT30/mITX based on Nvidia Tegra 3. 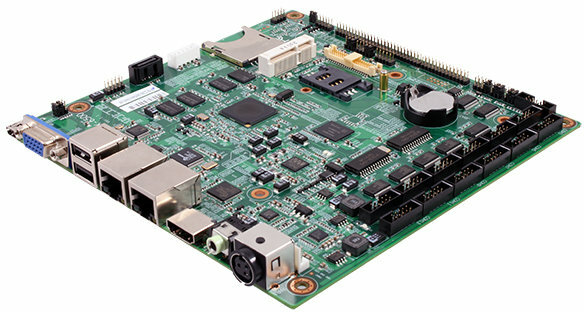 But there’s now at least one more mini-ITX ARM board thanks to Habey MITX-6500 embedded board. This mini-ITX board feature Freescale i.MX535 or i.MX536 processors, 1GB DDR3 and a 4GB on-board SSD. Since this is mainly an industrial board, it also features 2 Ethernet NIC and a whooping 13 COM ports. The board is suitable for a range of applications such as human to machine interfaces, data acquisition, point of sale, vehicle telematics, digital signage, industrial automation, building controls and connected appliances. Contrary to many other embedded companies, Habey also sells the board available to individuals. The board can encode 720p video and decode 1080p video thanks to the i.MX5 VPU. The company provides support for Android 2.4.5, Linux Kernel 2.6.35 or newer with Qt Extended support. Habey uploaded a rather boring video comparing full HD video (1080p) playback on an Intel Atom E460 embedded platform with their board. Yet the results are interesting. When the Windows 7 Embedded Intel platform plays back the video, CPU usage is about 70 to 85%, and it consumes 11 Watts. When the video is played on both Android and Linux on MITX-6500, the power consumption is 4 Watts. The video plays smoothly on all 3 configurations. Individuals should also be able to purchase the board, as the company explains that “the flexibility of this board makes it ideal not only for OEM/ODM projects, but also for hobbyists, modders and the DIY crowd”. There’s no mention of availability, nor pricing, so I’ll ask. You can find more information on MITX-6500 page.